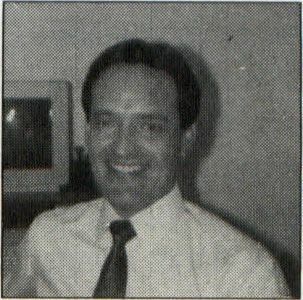 Arcadia, an affiliate of Electronic Arts, has had several excellent titles for the ST, including Rockford. However, Arcadia now has the distinction of producing its first "bomb." 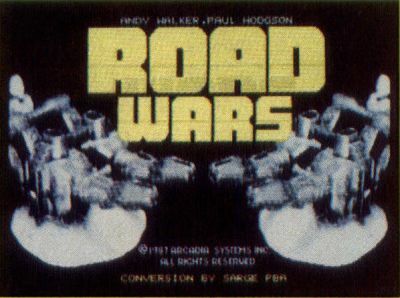 Roadwars is a loose translation of a title from another computer. Having seen the competition, I can say unabashedly that Roadwars ST is a project that should never have been released. Please don't confuse this game with a couple of other similar titles: Roadwar 2000 and Roadwar Europa, which are role-playing adventure games. Roadwars ST is strictly an arcade shoot-em'-up, with a smattering of strategy thrown in to keep you from yawning. Roadwars is visually intriguing; no one can take that away. This is what I would imagine a Zaxxon 3D to look like—without the special glasses, that is. 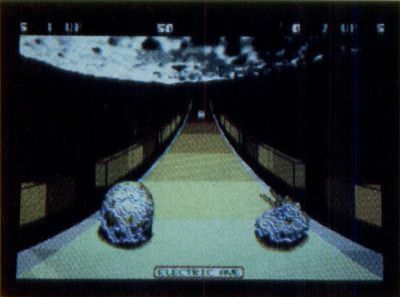 The top half of the screen is dominated by the moon that the player is traveling toward. The balance of the screen displays the current roadway in three-dimensional perspective. There are panels that line the outside edges of the roadways. These serve as barriers that keep you from falling off the roadway but, more importantly, provide the illusion of forward motion, like Pole Position's road lines that move toward the player. A joystick is used in the non-mouse port for a one-player game. A second joystick is inserted into the mouse port for a two-player game. There is also an option to use the keyboard. Some of these panels produce deadly sparks that span the entire width of the roadway. These blue panels must be destroyed. Once this is accomplished, green panels will appear, which are actually gateways to new roads. In other words, destroy the green panels, and you move up to the next difficulty level. A single player is equipped with two battle spheres that fight side by side along the roadway, the second of which is computer controlled. In a two-player game, both gamers simultaneously pilot their own battle spheres, either in cooperation or in competition with each other. To complete the game, cooperation will be essential. However, you are warned not to be too cooperative, for one player's games contain bonus rounds in which points are racked up by destroying the computer-controlled sidekick. A unique aspect to the game's graphics is the fact that the battle spheres are digitized from actual models, which makes them appear very realistic and three dimensional. In addition to the rogue panels and robot droids, a road warrior will be confronted with satellites that shoot laser beams, red energy balls that bounce along the roadway, spikes that are capable of penetrating shields and chevrons reminiscent of "Road Closed—Construction" signs. These are capable of destroying shields, if up, and battle spheres, if shields are down or depleted. Your battle sphere is equipped with twin laser cannons, which are formidable weapons in their own right. Provisions are made, though, for adding to your arsenal. If you run over an arrow in the road, you will be awarded an "orbiter," a smaller computer droid that orbits your vehicle and fires as you do. A joystick is used in the non-mouse port for a one-player game. A second joystick is inserted into the mouse port for a two-player game. There is also an option to use the keyboard, but I can't imagine why anyone would want to. Joystick control is smooth, but frustrating. To move left and right is simple and logical. To be able to fire weapons systems, the player must first lower shields by pulling back on the joystick. To aim the laser cannons, the player must use only the southwest or southeast positions of the joystick. I'm sure you can see the problem here, especially with joysticks that have short throws. The real drawback to Roadwars has nothing to do with joystick control. There are absolutely no sound effects representing the firing of laser cannons and their resultant explosions; just a short, ever-repeating, monotonous musical sound track that can not be turned off, unless you turn the monitor's volume control down. Furthermore, there is no high-score or game save. A high-score save is incorporated in virtually all top-shelf computer games. And without a game save, new game sessions will always begin with Level 1. This is, of course, typical of many coin-operated arcade games, but even Arkanoid allows the player to continue play at the level in which he lost his last life. Finally, I found it strange that even though there is no provision for saving anything to disk, and even though the drive's LED does turn off, the drive continues to spin, and does not stop until the computer is turned off. With a little more effort, this could have been a good game. But with so many marks against it, I can't suggest you purchase it.